Toby was roughly a year and a half old when I started noticing unusual behavior from him. He was urinating in the sink and bathtub, and his urine had blood in it. So naturally, I took him to the veterinarian. They tested him and said that he had a bladder infection. He was given pills and I was told to recheck in two weeks. When I came back in, there was still blood, so the doctor gave him a complimentary x-ray to check his bladder. Nothing. 9 visits later, he still had blood in his urine. He was given another x-ray only to find that he had about 2 dozen kidney stones sitting in his bladder The vet said this was a reaction to the food he was consuming-- IAMS adult food. The choice was clear at this point-- surgery. After that, he was put on special food and, even though I had four other cats, I still managed to keep him away from their food and feed him his. He developed this way of letting me know it was time to eat. I would ask him if he was hungry and he would look up at me and meow. I swear I’ve never seen anything so cute. He would then rush to the bedroom where I kept his food and jump up on the bed and wait for the food dish. He was in the hospital for a week. I made frequent visits to see him every day. I could tell all he wanted was to come home; he was so upset every time I left. I stayed with him for at least an hour when I came, and then some. Toby had to have what’s called a urethrostomy, which is where the surgeon cuts off the male parts and shortens the urethra. Apparently, boys have a longer one than girls which is why they have more problems in this area than females. 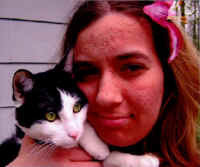 So, my cat, in technical terms, became a girl, but was still always my baby boy. It didn't matter to me, as long as he was healthy. I got him home on a Saturday and, because of the nature of his surgery, he had to have a cone on his head to prevent him from going near the area. I could not keep him from doing that, so I had to board him back at the vet's for two days until it healed a little more. I was so scared that he was going to hurt himself. The area had already started to bleed a little, so I immediately rushed him back after having him home for a short two hours. He came home on Monday and everything was fine for about 3 weeks, until March 8th. I remember this moment, this image so clearly in my head because it's one of the days I’ll never forget. I was talking to my friend on the phone with a direct view of the hallway when I saw Toby walk in front of me like a goose. I'll try to explain: his back legs were as a goose walks, except, as we all know, cats are not that good of impressionists. I freaked out and called the vet, and within 5 minutes I was out the door. I got there and handed him over to the receptionist, and then proceeded to sit down and wait; for what, I didn't know. I sat in that waiting room and cried for about an hour waiting, thinking what had I done wrong. A lady came over to me and asked what was wrong, and I told her as best I could, was wrong. I couldn't say much, seeing as I was hysterical at the time. They couldn't tell me anything at the time, only to sign something saying that if need to, they could give him anesthetics to explore the problem. I had to drive myself home crying and waiting for an answer. They called me a few hours later, only to tell me more bad news. Toby had thrown a blood clot. This technical term was characterized as Saddle Thrombosis. He had lost all feeling and movement from his hind quarters down. The prognosis was dim. The recommendation was to wait it out a few more days and see if any progress was to happen, but as I sat there and read the stories of other people's misfortune with this problem my mind began to doubt. And then after crying again for God knows how long I put aside my fear and decided that I wasn't going to except it. I had been praying every night since all of this started and lighting a candle for him, even cut flowers outside my house and put them in a vase with candles surrounding the vase, and lit them every day for Toby's safe return. They said the best thing I could do was bring him home and begin kitty exercises with him; for example, leg exercises to regain blood flow to his legs, even warm submersion in warm water to help it along. I brought him home March 14th, I did this every day, without fail. He was also on four or five different medications that had to be prepared every day for him, he hated them all. I would. too. I remember the night I brought him home I kept him on my bed with me, and not once did my hand leave his body. I kept waking up looking at him, thinking his heart was going to stop, but it didn't. He just slept he was so happy to be home with his mommy, he didn't leave the bed all night. He seemed to be doing much better; I could feel warmth moving through, but not all the way. He had a check up appointment on Friday, the 18th of March, where they did what’s called a prick test on his leg. Needless to say, that does not sound pleasant. They said he seemed to be doing better, but no blood flow yet. I was to keep working with him every day. The next two days went by without any commotion, and I was to go back in with Toby on Monday again to recheck. I thought everything was fine, only to find out March 21st, would be the second to the saddest day of my life. His doctor said the prick test site had become infected and the other leg was fast developing an infection due to the lack of blood flow in his leg, and that he was unable to fight of the infection. Telling this story is just making me relive the whole ordeal. My choices were none of which I wanted to hear. I could take both of his legs and put him in a kitty cart, and have to watch him suffer straggling around, trying to take care of himself. You see, I don't believe in prolonging agony with animals. It's wrong because no matter how much you want to hold on, your pet can't tell “you let me go, let me die.” We, as humans, were unfortunately put into that role. Once you take a pet on, it will ultimately become your decision one day, it happens to us all. 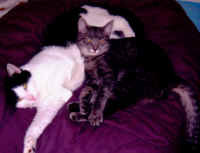 It's a very hard choice to let a loved one go, as they become more than a pet. They're more like a child as I stated before. Toby was my baby. The other choice was obvious let him go. The thing that killed me the most was that the doctor told me almost all animals she sees with this exact problem are in horrible pain. Toby wasn't. He acted as if he didn't even notice his legs were gone. He was happy every day. I think a little something was missing in his normal behavior, but other than that, he was just the same old Toby. I asked the doctor if I could have one more day with him and she said “of course.” She put antibiotics and fluids on board, that's what she called it, and they actually made a big lump on his back. What felt like a balloon filled with water. I took him home and said I’d be back in the morning, at 8am. I got him home and he just laid in his carrier. My mom asked me if I wanted her to be there, and I cried to her and said, “yes.” She flew up that night from Sacramento, CA, as I was in Washington State, and as I was driving to pick her up, I just couldn't stop crying, thinking that at this time tomorrow I wouldn't see his beautiful face anymore, that I wouldn't be able to hold him or kiss him. Toby and I had a very special relationship, he was the only cat to ever come right up to my face, very slowly, and sniff my whole face starting with my nose. I think that shows a big sign of trust when a cat is that willing to get that close to your face, especially as much of a frady cat that he was. I picked up my mom and went home. She and I spent the whole night with him; he just seemed relaxed and calm. The next morning, I couldn't bring myself to go in, so I called the vet and asked her if afternoon would be ok. She said ok. I took so many pictures of him that day and the day before, even one of him and me in the sun. The very last picture I took of Toby was of him lying down on his bed with his left paw over his face, covering his eyes. We took him to the vet at about 2 or 3pm that day, March 22nd. I remember wrapping him in a big beach towel. He didn't move the whole way there, he just buried his head in the towel, completely covered up. We arrived, and I can remember looking up at the office and thinking "I don't want to do this." We got into the room and just waited for the doctor. She came in and told me that she would start first with a numbing shot in his spine to relax his body, basically to make him go to sleep, but not die. She told me it would take up to 15 minutes to take effect, and then she would come back to finish with the actual shot. I sat there and held him in my arms for what seemed like forever, but not long enough. I noticed that he was starting to lose motion and the ability to move. His eyes just became more relaxed and sedate. I kept telling him that I loved him and that soon he would be with his brother. It seemed like I couldn't say enough, like there wasn't enough time left in the world. To this day, and probably till the day I die, it kills me to see people neglect their animals. Pets aren't just something you have in the house to look pretty. They are living creatures that require things, such as a warm place to sleep and live, a clean place to go to the bathroom, and above all, somebody who will provide the right choices of food. I learned that all animals are different, of course, and that their systems are going to react differently to different foods, but it is our responsibility to pay attention to the food choices we make, not just throw the cheapest thing in your shopping cart. Most people in this world don't understand what it is to have the love and companionship of an animal, no matter what kind they are. Every living thing needs some form of love or attention. It makes me mad to know that there are people in the business of making cheap by-product foods to save money, for instance PEDIGREE and PURINA, which are the same companies. We all make mistakes, but when a mistake costs you one of the best friend's you ever had, you tend not to just let it roll of your shoulder. I love Toby and always will. I miss him sleeping on my pillow and so many other things. I hope one day I will see him again, and believe that I will. I want all readers to know that just because your prayers aren't answered the way that you hoped they would be it does not mean that God does not exist, or that he is just mean and cruel. He just has other plans for your angel. So please do not be discouraged I still pray for many things in my life; it is good to believe in Him. Please take care of your pets, and remember they can't speak to you, but they have their own way of letting you know when something’s wrong. Don't ignore them. Don't neglect them. If you do any of these things, you don't deserve their love. 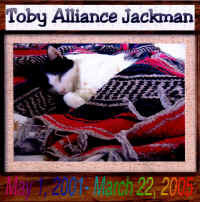 Toby was 3 years and 10 months old, much too young to be taken. I hope you cherish all the time you are given to spend with your animals. I know I did, and still do.